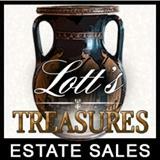 Lott's Treasures is Hosting a Sale in Marietta. One Day Sale All Must Go!! -Household Items - Bicycles - Costume Jewelry - Collectables and much more! !